Desi weddings are incomplete without henna. This type of temporary body art is commonly seen during celebratory events and is done to highlight happiness. Its use as a way of creating body art was common in South Asian countries and typically used by Desi women.However, it has become popular all over the world and western women are also participating in the art of henna wearing. Both of these terms mean the same thing. The word ‘mehndi’ holds a Hindi origin. On the other hand, the word ‘henna’ has Arabic roots.Both terms describe the same dye, however, the difference lies in the use of each.Henna is the scientific name of the plant from which it is extracted. 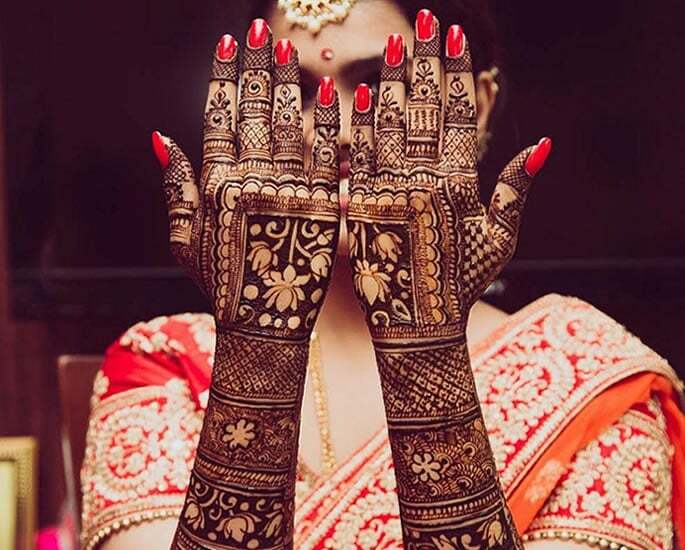 Mehendi is the name widely used in the Desi culture.Its origin is from the Sanskrit word “medhika”. It is generally used to describe the term henna in Hindi or Urdu. Mehendi is basically the art of applying henna to the body. It is a powder that is extracted from a plant. The leaves of the plant then are crushed into a fine powder. The word Henna originates from an Arabic word “Al-Hinna”. The plant is typically found in warm climates such as Egypt, Kenya, Afghanistan, Iran, Pakistan and India.The history of henna dates back 9,000 years to ancient Egypt as a means of colouring their hair and nails to make themselves more beautiful. Egyptians also painted the nails of the mummies before burying them.After centuries of migration and socialisation, its origin has been difficult to determine. One cannot put a finger on the timeline as to when this started. In the written record, Ebers Papyrus, which is a medicine-related book, it is said that henna may have been around since 1,550 BCE.This book carries treatments for injuries and it stated many medicinal advantages for henna. It says that it can be used for rashes and headaches.While it explains it’s origin as a health benefit, there is no origin for the use of henna as a beauty product. Some historians have said that henna originated from India. It is believed that henna helped them to stay connected with their spirituality.Historians found the use of henna in various other parts of the timeline. Some paintings found suggest that Queen Sheba also used this form of art.Catherine Cartwright-Jones believes that henna came from Crete, Greece. Its history is as old as 3,000 to 6,000 BCE. But the clear evidence remains that of the mummies.Ancient civilisations were aware of the properties it contains. The history of henna in the Indian subcontinent is a very interesting one as some researchers strongly believe that it originated there.Mughals introduced it in the subcontinent during the 12th Century. Initially, it was used by Royals but later began to be used by all.The presence of henna goes back to the 4th and 5th century. In Ajanta (India), several murals depicted women with henna as body paint. The beautiful stains of mehndi are used as a temporary tattoo and now it is getting a lot of attention in the west. During the 1990s, these temporary tattoos went to the West with the immigrants. It became popular among celebrities.From Beyonce to Madonna, all of them sported this art. Catherine Zeta-Jones and Naomi Campbell also pioneered this art in the West.Madonna’s appearance with mehndi received a great response and sparked an obsession with this art. The main alternatives include ALTA, digitally embellish temporary tattoos, temporary tattoo stickers and white henna.ALTA is also known as Bengal rose. It is typically used by the Bengali women on their hands and feet. Digitally embellish temporary tattoos are another great replacement. It has been a recent interest in weddings. This is a great alternative as it gives an authentic appearance of temporary body art, however, it is costly. Temporary tattoo stickers are the easiest alternative as it only takes a short while to be applied. White henna is a great option for those who do not like the smell of regular henna.